Munch Gallery is pleased to present 'Verge' - a group exhibition curated by Mie Olise. To be ”on the verge” is to approach something closely, without quite giving over. It’s an ambigous state. Such states are difficult to navigate, they don’t give us easy answers. This is particularly true in painting. 'Verge' at Munch Gallery brings together a group of painters who span generations and contintents. The connecting thread woven here is a marked interest in paint handling that marks the boundary between representation and abstraction. New York painting has a long history. In its current form, long held distinctions between abstraction and figuration are crumbling and reinventing themselves. Painters are forming mini-subcultures. The new work coming out of this tradition is refined, playful, unrestrained. For this show, Mie Olise has brought together a group of artists whose work celebrates honesty in the informal. ”Verge” is comprised of Amy Feldman, Katherine Bradford, Emily Noelle Lambert, Anna Kunz, Florian Meisenberg, Mie Olise and Jason Stopa. For the artists in ”Verge”, there are many antecedents both abstract and representational. Bridging the two is difficult. Ambiguity is not an end in its own right, but rather a gate to expand our awareness of a given subject. The exciting aspect of this painting is that it naviagates in-betweenness, as such it has the unique capacity to speak about doubles. Yves Alain Bois argued in Painting As Model to move away from the literal. Therein, he points to French philosopher Hubert Damisch. Damisch wanted to get rid of the notion that texts are to be found in images. At the time there was the popular theory that behind every image is an illustration or caption to explain or justify its existence. 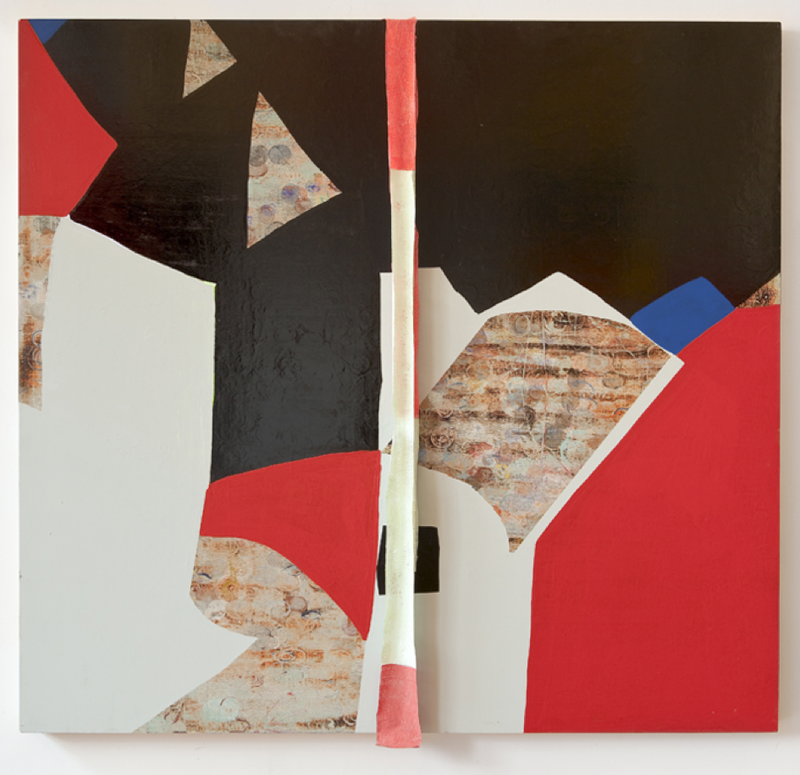 In the place of ”texts” Bois sought a painting that operated beyond language and closer to the realm of perception, symbol and technique. Mid 20th century abstraction functioned as a wall or surface that was impentrable, eschweing the pictorial in favor of flatness. This was the now well-known terrain of Greenberg. Formalist abstraction eventually culminated in its logical conclusion in Michael Fried’s objecthood and the minimalist impulse of the 60s and 70s. To simplify, abstractions leads us into areas of visual perception that we can’t name. At the same time, late 20th century representational painting remained the arena of narrative. It’s seeing a part of the world at a distance and compartimentalzing. Using accesible vernacular, such work held on to concepts, history and mass culture. This was evidenced in the work of Andy Warhol’s pop icons and consumer goods, Richter’s photorealism of political catastrophe in the 70s, and Luc Tuyman’s horrific source material. Such work takes a lens onto the world and crops out a window. Whatever the image, it has its root in certain ”givens.” It takes that which we already know and refigures it. curated by Mie Olise and featuring work by: Amy Feldman, Katherine Bradford, Emily Noelle Lambert, Anna Kunz, Florian Meisenberg, Mie Olise, and Jason Stopa.